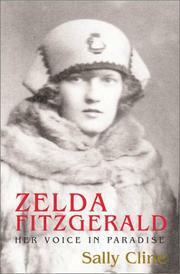 Wrapped up in a thorough biography, a strong case for why the unfortunate Zelda Fitzgerald should be remembered as an artist foremost, not merely as a victim of mental illness. Zelda Sayre Fitzgerald’s life story is fairly well known, at least in broad outline, to students of American literature, if largely as a tale of star-crossed love. An Alabama debutante, she met Scott Fitzgerald at the end of WWI, was duly infatuated, married him—in a ceremony, notes British writer Cline (Women’s Studies/Univ. of Cambridge; Couples, 1999, etc. ), that her parents refused to attend—and went on to become a bon-vivant fixture of the Jazz Age, only to go mad and, eventually, to die in a fire in the asylum where she was confined. Cline revisits these events while threading in useful notes on Zelda Fitzgerald’s artistic accomplishments (and not-so-useful remarks that smack of currently fashionable lit-crit, talking as they do of “invisibilized” art and whether Ernest Hemingway was gay). That Zelda’s life was tragic almost goes without saying, but Cline carefully assembles evidence to show that she surely had more than her share of sorrows: at the end of her life, Zelda narrowed them down to a list of her four most traumatic experiences, of which the breakdown of her marriage to Scott (mostly owing to his alcoholism, but also to her advancing mental illness) was but one. Cline does an equally careful job of establishing and maintaining an argument that Zelda was an accomplished artist in several media, especially painting and dance. Though contemporaries such as Malcolm Cowley were less than wowed by her work (Cowley complained that Zelda’s paintings were “flawed . . . by lack of proportion and craftsmanship”), Cline suggests that it was good enough on its own terms to fuel Scott Fitzgerald’s abundant insecurities, one more cause for the disintegration of their marriage. Though less fluent than Nancy Milford’s now-standard, 33-year-old Zelda, Cline’s account should find considerable following among students of women’s literature and art.